35,000 turned out in D.C. for the climate rally last weekend. That says EVERYTHING. (CLEAN) POWER TO THE PEOPLE, RIGHT ON. In 2005 I made a great little 6 minute video with Mark Dowie, the longtime constructive critic of the environmental movement and author of THE book that every environmentalist should have as required reading, “LOSING GROUND: American Environmentalism as the Close of the Twentieth Century.” The book was nominated for a Pulitzer Prize and is mandatory for all those who live by the quote about not wanting to be condemned to repeat the past. My video was great, not based on the filmmaking (all I did was set up a camera and let him speak his wisdom, from which I pulled out 6 of the most powerful minutes), but based on the wisdom he conveyed. First off, he quoted famed grassroots activist Saul Alinsky (the guy Hillary Clinton did her thesis on which is used by the far right to argue that she’s some sort of demonic socialist) with his term, “TOTAL TACTICS.” That’s the first thing to consider with what Bill McKibben has created with 350.org. As Theda Skocpol pointed out last month, they failed. Yes, Cap and Trade worked great for acid rain. But it wasn’t as simple as just going for it again with the climate. It would have been nice if the masterminds of the climate effort had taken a Total Tactics approach of simultaneously creating a coordinated mass movement to accompany the congressional effort. It would have been nice if there had been climate rallies in the spring of 2010 of 35,000 people showing support for the Waxman-Markey bill, but there wasn’t. I tend to view the world in terms of the cerebral/visceral divide. My take on the rally is that “the message” is the cerebral element. 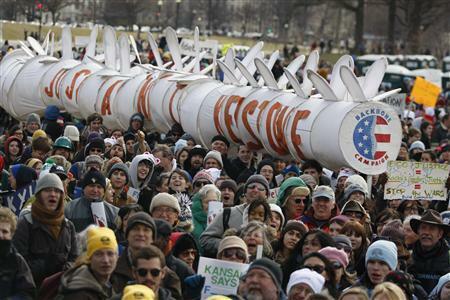 Some might think “the message” of the rally was the Keystone Pipeline, but really the actual message of 35,000 people is much simpler — it’s that 35,000 people care enough about the fate of the climate to turn up. Who cares about the specific message of a mass rally for now. Just get the bodies out there. Which is what 350.org understands and is doing. THAT is the visceral component — the live action, the experiential. It’s much harder in today’s internet-distracted world (keeping in mind Malcolm Gladwell said, “The revolution will not be tweeted,”) but at the same time, it has more significance and meaning than ever before. And it’s what has been missing. So I say kudos to McKibben — the guy most likely to provide the LEADERSHIP that the movement has sadly lacked. As Mark Dowie said, you have to have the grassroots element as well as the NGO’s. Both levels are essential and equally important. And they need to respect each other. The D.C. climate rally is a major step forward in creating a mass movement for climate that will eventually work. Unlike what has transpired so far.